This is a special episode for me and I’m confident it will be for you as well. My special guest is Tim Braheem. If there’s one word to describe Tim, it’s authenticity. Have you ever been around somebody and they make you feel better, think clearer and understand the truth about what’s really important. For me, that person is Tim Braheem. Do you want a career you enjoy? One that you look forward to going to every day build really meaningful relationships with real estate agents and anybody else you would want to build those relationships with? If you’re looking to live an authentic life and be true to yourself business, this podcast may hold something for you. In terms of annual production from 1997 to 2004; Tim was consistently ranked among the top 50 loan officers in the country. In 2004 at his peak, Tim closed an astounding 676 loans for over two hundred thirty six million in volume, ranking him number 26 in the U.S. out of 400,000. Loan officers. Because of Tim’s achievements, Mortgage Originator Magazine inducted him into their Loan Officer Hall of Fame of which only seven loan officers have been ever inducted into. 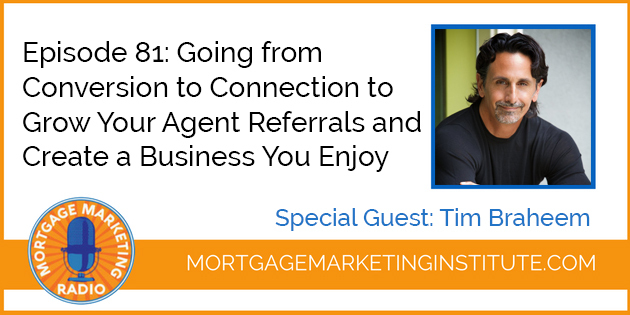 Tim’s went on to become a co-founder of Loan Toolbox which was one of the greatest online resources for training, tools, support and coaching to help us all get better and become more effective Mortgage Originators. Tim is now the CEO and founder of Performance Experts once again impacting lives, helping people to live a life they perhaps thought once was impossible.